Please note that parrots from the Poicephalus family are also commonly referred to as "Short-tailed Parrots"
The Short-tailed Parrot (Graydidascalus brachyurus) is the only species of the genus Graydidascalus. 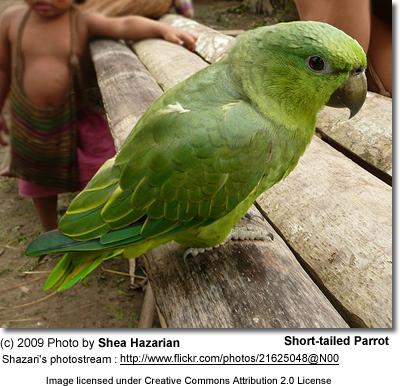 The closest relative is the Yellow-faced Parrot (Salvatoria xanthops) and the members of the genus Pionus. The Short-tailed Parrot occurs naturally in the rain forest of the tropical zone, with populations existing along both sides of the Amazon river in northernmost Brazil, south-eastern Colombia, eastern Ecuador and eastern Peru. It can also be found in the coastal deltas of French Guiana and Amapá - a Brazilian state located in the extreme north. Outside the breeding season, they are usually found in large, noisy flocks that can be heard from a distance. They prefer trees along water courses. These parrots tend to gather towards the evenings on roosting trees. Even though this species is considered common in parts of its range, speaking in general terms, this parrot is considered endangered in its natural habitat (CITES II) due to habitat destruction and capturing for the pet trade. The short-tailed parrot averages 24 cm or 9.6 inches in length (including tail). 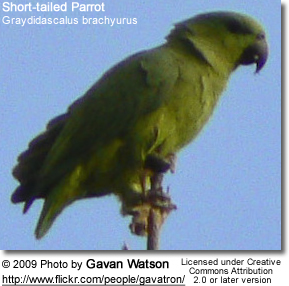 This parrot is overall green with a dark bill that is larger than that of the average parrot. As is suggested by its name, it has a very short tail. Adults show a small maroon-red spot on the shoulder and at the base of the outer tail-feathers, but typically neither are easy to see. Captive breeding successes have not been recorded yet; although several females laid one or two eggs, but no chicks hatched. In their natural habitat, the average clutch consists of 3 to 4 eggs. The incubation period is about 24 to 25 days. Aviculture: These are noisy parrots, which should be a consideration if neighbors are in close proximity. On the other hand, they are not known for chewing and destructiveness, and quickly grow confiding. They do well in communal aviary settings, usually tolerating other species quite well. They are susceptible during the acclimatization period, so a suitable shelter that protects these parrots from the elements should be provided. The minimum temperature they can tolerate is about 15°C (59°F). In colder climates or seasons, heat needs to be provided. The recommended flight size would be: 9 x 5 x 6 ft (3 x 1.5 x 2 m) or larger. A suitable nest box would be 8 x 8 x 16 ins (20 x 20 x 40 cm). Captive Diet: They should be provided with plenty of fruit (including berries, bananas, peaches, mangos, apples, etc.) and various vegetables. A high quality seed mix of safflower, wheat, oats, buckwheat, hemp, canary grass seed and various millets should be available at all times. Additional food items, include rose-hips; elderberry and rowanberries; half-ripe maize; various green food. Supplementation with vitamins, especially vitamin C, and minerals, may also be necessary for good health and breeding results.